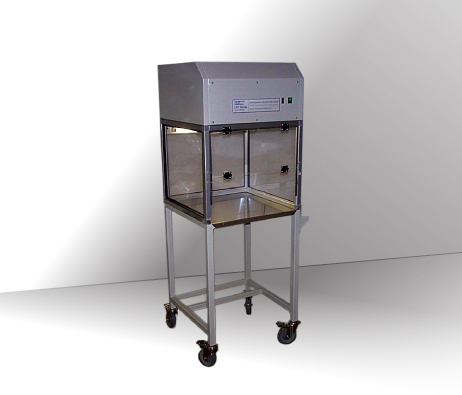 The LFC Series fume cabinet is a compact, recirculating fume cabinet that has been designed to provide operator safety and ease of use in laboratory applications. Capture of fumes is achieved by inward airflow at a velocity of > 0.5 m/s and carbon filtration of exhaust air. The upper housing contains the mains switch, low-airflow alarm, speed control and carbon filter. Cabinets are supplied with an open base and can be positioned over an existing utility such as a sink or be placed directly on to a flat bench. The LFC cabinets are available in three widths; 600mm (LFC60), 900mm (LFC90) and 1200mm (LFC120). An optional work tray, manufactured from polypropylene, is available if containment of spills is required. A trolley stand is also available as an option across the LFC cabinet range. The standard activated-carbon filter filter is suitable for use with a wide range of common laboratory fumes. Special-purpose carbon filters for specific applications are available to order.